You cannot edit an existing Payment Account. You can only delete and add new payment accounts. If you are replacing a credit card that is about to expire, we recommend that you first add your new Payment Account and then delete the Payment Account for the soon to expire credit card. 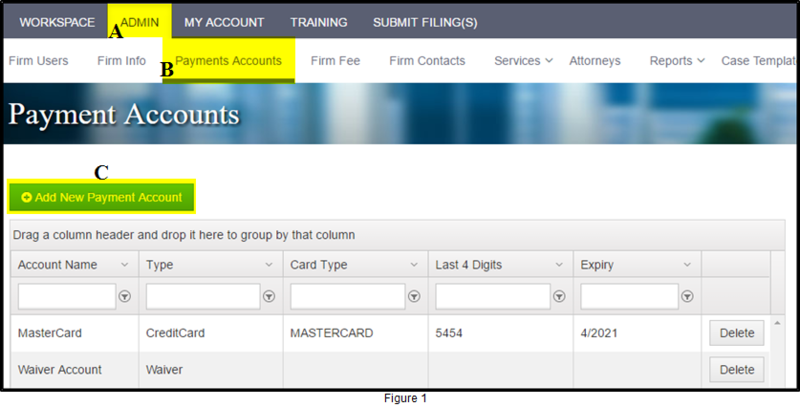 Login to FileTime as a firm eFiling Administrator. Click the Admin button on the top navigation bar (Figure 1, A). Click Payment Accounts on the sub-navigation bar (Figure 1, B). You are taken to the Payment Accounts page (Figure 1). Click the Add Payment Account button (Figure 1, C). Name the account something like Firm Account. Leave the default CreditCard option under Account Type. You will then be taken to a page notifying you that you will be leaving FileTime and taken to Chase Bank's PaymenTech system. Click continue then enter your credit card information. After entering click continue again then click the save information button. This will then take you back to the Payment account where you will be able to see the new account activated. If you experience a time-out issue during the process that is almost certainly due to a Safari browser issue with the eFileManager system sometimes encountered during a Payment Account set up process. The only solution is to use another browser such as Firefox to complete the Payment Account set up process. Use a Waiver account for submissions of your indigent filings. The fees will display up to the time you submit the filing(s). All fees will be waived, however, when the clerk accepts the filing(s). Name the account something like Waiver Account. Change the Account Type to Waiver. You are now done and ready to eFile.